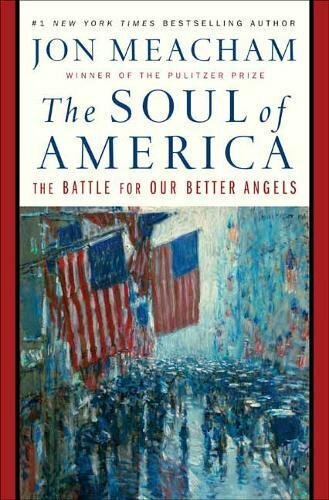 Jon Meacham’s new book, The Soul of America: The Battle for our Better Angels provides a condensed view of the history of the United States, chronicling the tougher times that we have endured. I enjoy reading history, and at my age, I’ve lived a lot of it! What strikes me in reading Meacham’s book is how our history has been distorted by the story-teller, and even when living through an era, our memories are imperfect. As Jon’s book unfolds, he gives us hope that just as in times past, the right parts of humanity prevail and we are a better society when we band together with simple messages about loving one another and caring for our neighbor. It was the perfect reading material last week to follow Presiding Bishop Michael Curry’s inspiring sermon at the Royal Wedding of Prince Harry and Meghan Markle! I’ve been to museums that attempt to convince that the Civil War was really all about the financial challenges of a cotton-based economy. Not so fast. Jon cites numerous politicians and authors of the time: it was clearly about slavery and racial injustice. But what I didn’t know is that Abraham Lincoln had changed his position on slavery, first agreeing that no slave owner would have to change in the South, but then eventually turning to an emancipation of all slaves regardless of location. I remember how excited my mother was when JFK was elected. Both my parents were staunch Republicans but also Catholics. My mother said that a Catholic would never be elected to the US Presidency as she carried the stigma of being the daughter of Polish Catholic immigrants. I had forgotten that the Ku Klux Klan wasn’t just against African-Americans. They hated Catholics and Jews, too. How easy it is to block our memories when we encounter sin. May we start telling the truth, not blocking sin from our memory but overcoming it.